The Great American Eclipse didn’t go over my house. We had 75% coverage, which was enough for the sky to darken a little and beautiful crescent suns to appear on the patio under the leaf-covered pergola. 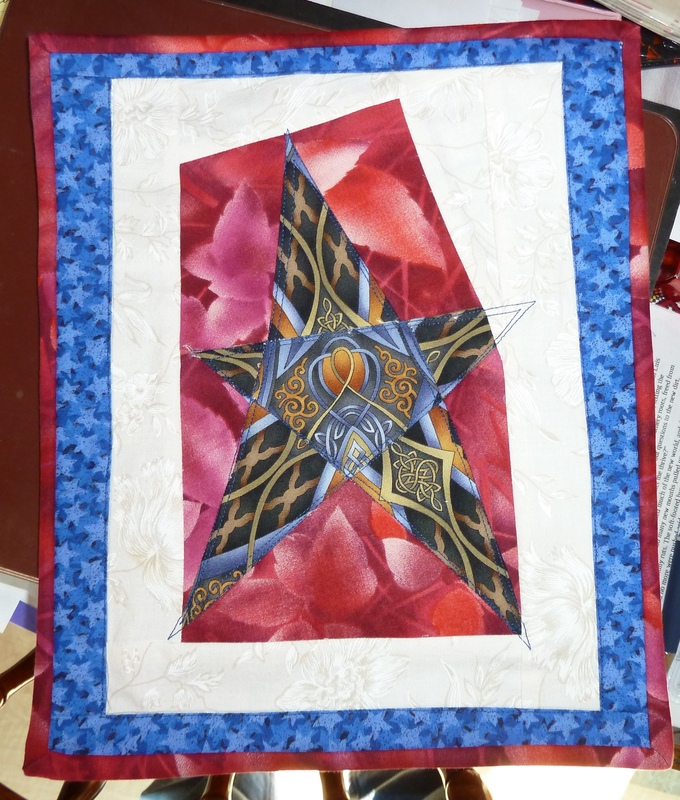 I wanted to make an art quilt to commemorate this gift from the sun (and moon), and used the American Quilter’s Society free pattern “Luna” as a starting point. The pattern represents a lunar eclipse. I turned my version into a solar eclipse with embroidery and a well-placed button. The base is a piece of hand-dyed wool felt that fiber artist Gail Sims made. She used leaves she collected from her yard. I liked the idea of showing the progress of the eclipse on the ground, which is the way I watched it. The next gifts come from a land of midnight sun. My friend and sister quilter Margaret Misegades was on a cruise to Norway. Knowing my fondness for antlered animals, she found something reindeer at each port of call. I plan to use my little pitcher for cream once the temperature drops enough that I can drink hot tea again. The reindeer magnet is remarkably strong as well as just so darn cute. Even my grocery coupons look cool underneath it. These pencils are wonderful, and I still use pencils a lot, but to be honest I’m thinking about using them as part of a table display for Christmas with flowers – fresh or silk – and maybe one of my birds. This is a Christmas present from my son. The kids sometimes tease me about my odd collections, but they know how to make me smile. Having something to smile about will be important in the coming weeks, because my Christmas present to myself was permission to ignore the projects in the sewing room. 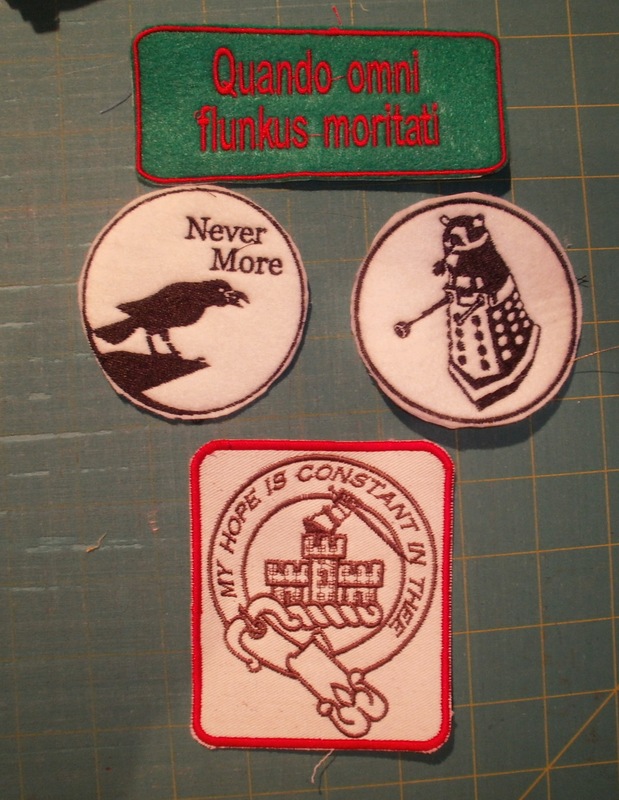 I did manage to start one project, turning chenille into products that might be marketed with The Chenille Ultimatum. My co-author Ann Anastasio saw a tote bag with raw seams that we thought would work well for chenille. Turning the pillow corners took nearly as long as sewing the entire envelope. 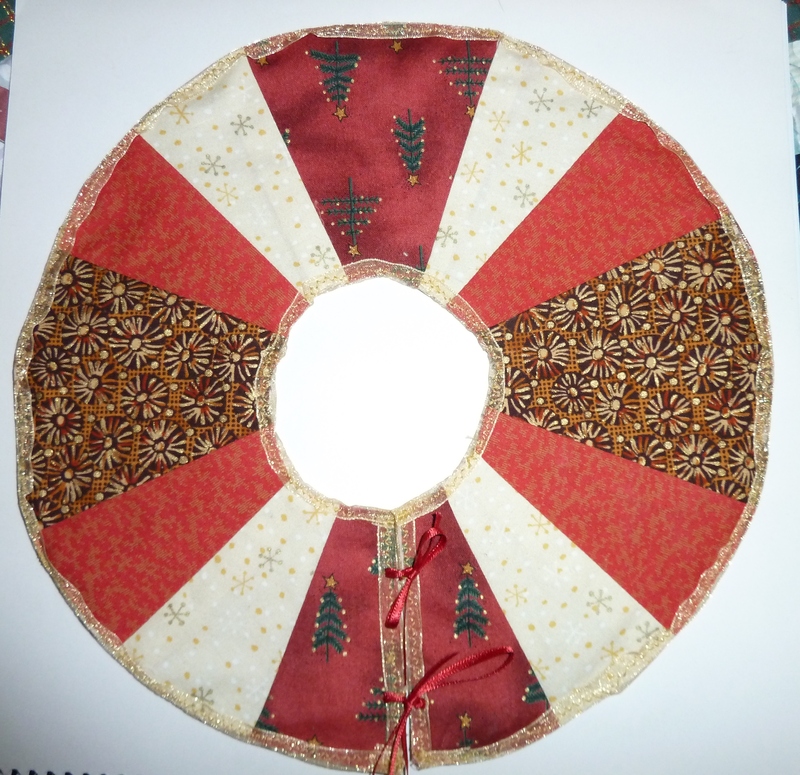 I’m not sure if it would be easier to make a round pillow or to try inserting tassels in the corners to hide any irregularities. Those are questions for another day, however. 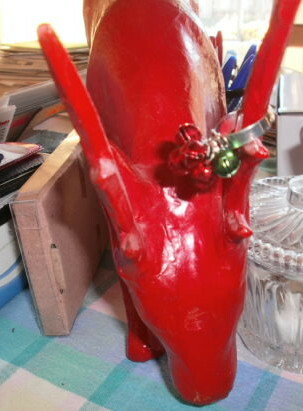 Today, I’m going to admire my new reindeer, and ignore my projects as my New Year’s gift to myself. Rather than amassing my reindeer collection, which takes more open space than I will ever have, this year I decided to scatter selections throughout the house. Here is another grouping. Yes, the stuffed toy is actually a moose. I don’t care. One day I might even make a reindeer-moose convergence quilt for the holidays. I also have a bird collection, and a basket collection. Combining the two seemed reasonable. My son gave me this TARDIS tea ball. I used it for tea once and decided it was more pleasant to look at it than to clean it. It is now a decoration in my kitchen. This is the first year I’ve displayed it on the tree. Here is my gift to you – a link to The National French Toast Alert System. Plug in your zip code and find out if it is cold enough to stock up on milk, bread and eggs (the usual items people seem to grab when the weather gets cold and nasty). Enjoy the holiday season, no matter what you celebrate. Aside from the spiritual significance of this time of year, for me it’s the season of the solstice, Santa and SAD (Seasonal Affective Disorder). I love the holidays, but lack of sunlight is a problem (the cold doesn’t help). This year, I decided to take the advice I’ve given to others and began a yellow project. Apparently surrounding yourself with yellow helps with mild cases. Getting more light does, too, but if you’ve got more than the winter doldrums give yourself the gift of medical attention. We spend so much time taking care of others, we need to remember to take care of ourselves. Some people collect Santa figurines – I collect reindeer and moose (although the kids swear I only have moose). This year I also acquired a jingle ring that is less fun to wear than I expected. It now graces this reindeer’s antler. Years ago I made Christmas stockings for the family. 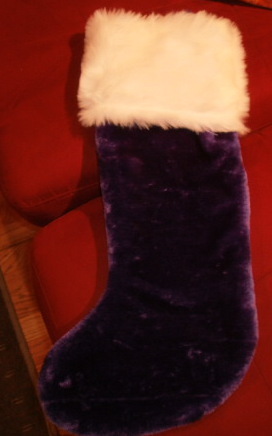 I really like the one I made for me, but I saw this purple stocking in the grocery store. On sale. “Self,” I asked myself, “how can you resist?” I decided I couldn’t, and bought it. After I finished wrapping and baking and cleaning, I had a few minutes to myself. 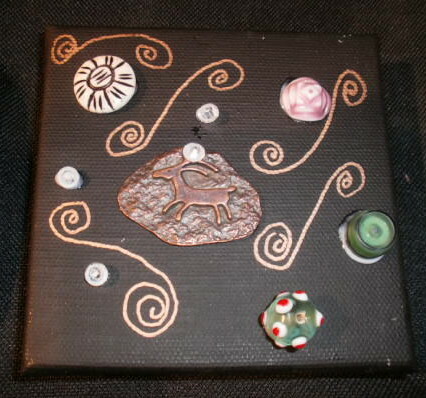 The small black canvas reappeared as I was searching through one of the piles, I had some beads out, and I found the right glue (and my copper marker), so I entertained myself with a little solstice decoration. Take time to enjoy whatever holidays you celebrate in your own way! The week between Christmas and New Year holds such promise. When the kids were younger I always planned to do great, fun things on their vacation. When they got older I planned to do great, useful things around the house. But we all know about plans . 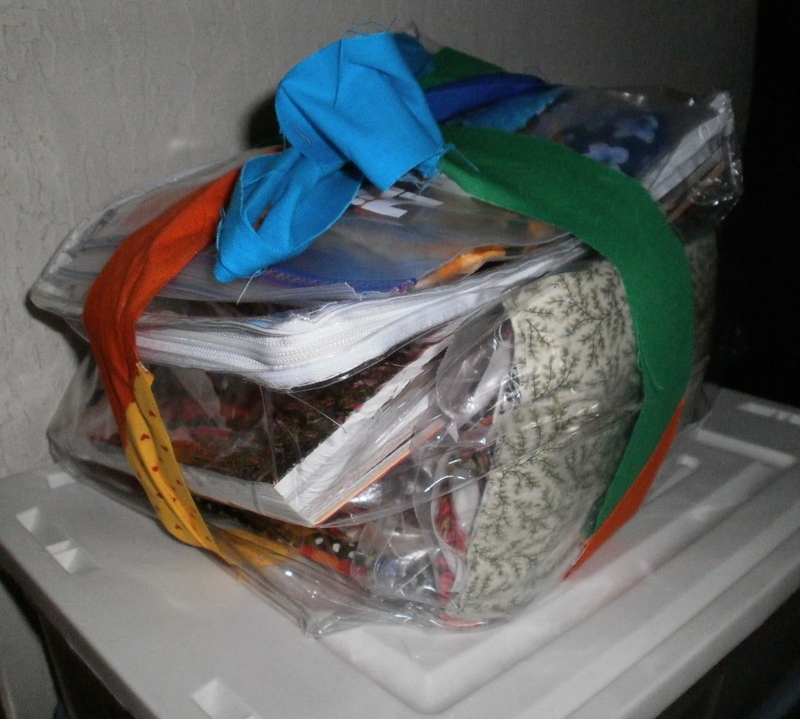 . .
At any rate, I did manage to do some things in the sewing room. I started a free-form stuffed collection that I hoped would look like Christmas ornaments that I could pile in a decorative bowl. 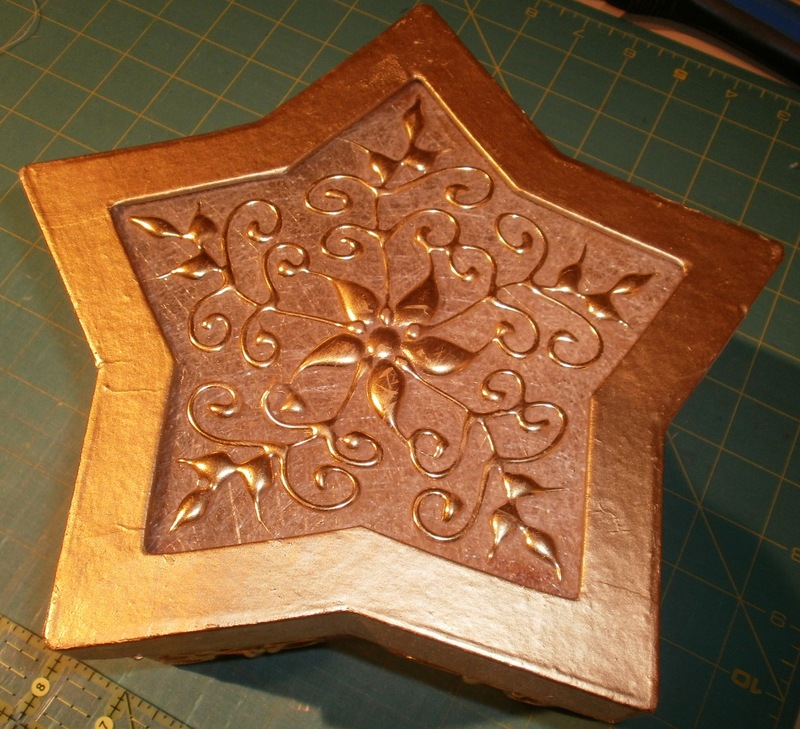 I still like the concept, but I’m going to have to spend some time auditioning embellishments. My daughter asked if I would make a name tag for her dog’s Christmas stocking. She asked on Christmas Eve. After dinner. Luckily, she liked what I did. The week between Christmas and New Year holds demands, too – specifically the demand to clean up the place. Given that I still have my Easter Egg collection out on the hutch, I’m not holding out much hope for getting the Christmas moose/reindeer collection back in storage any time soon. Still, it is Boxing Day today, and regardless of what it might mean in the U.K., at my house it is a reminder to get out the boxes and put things back where they belong. My kids may be grown, but I still buy them Advent calendars every year (chocolate-filled, of course). There’s something about opening little boxes and getting a surprise that everyone loves – or at least everyone I know. The promise of a reward is a great motivator, in work and in art. 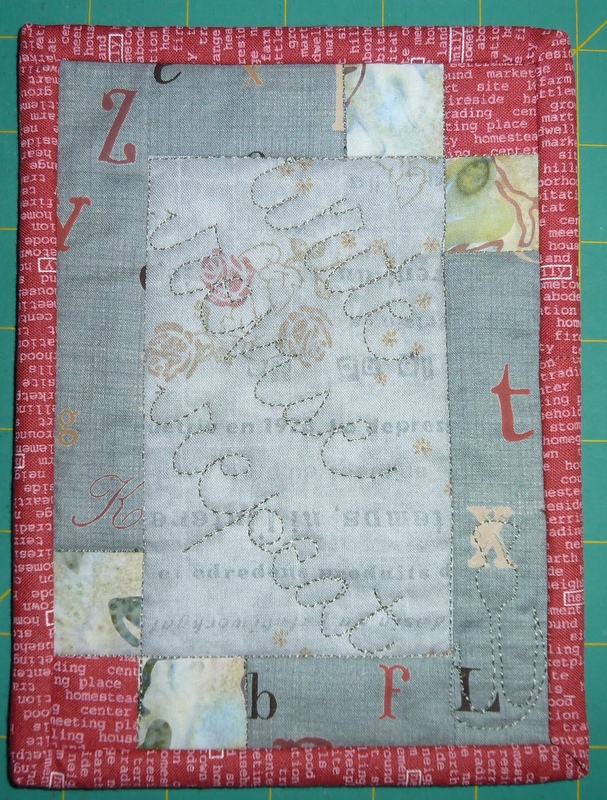 I’m experimenting with chenille because the sequel to Death By Chenille should be available in April 2013. That book will be called When Chenille Is Not Enough. Getting these small pieces embellished for the meeting was the first of my countdowns. There are still a few other projects with their own countdowns on my to-do list. Here’s hoping all our year-end countdowns go smoothly! I was all set to start my annual December whine about being too busy to enjoy the holidays. Then my friend Maya Madhavan asked if I would bring her projects to the Progressive Party. Yes, that’s projects, as in plural. She won’t be able to attend for three months and she got them all done ahead of time. While she’s working. And taking care of her young family. And fitting in the holidays. I have no excuse. Maya’s projects – done ahead of time! Instead of whining I remembered “The Night Before Christmas” – especially the line about dash away, dash away, dash away all. Dashing about without a plan is as useful as those nutrition panels on the back of candy bar wrappers (you can only read them after you’ve opened the wrapper, and once the wrapper is open you know you’re going to eat the candy, so why bother reading how bad it is for you? ), but I have lots of to-do lists, which can fill in for a plan until something more reasonable comes along. Similarly, dancing is best when done with joy, even if your feet are hurting. Joy comes from within, which leads me to discipline. That also comes from within. 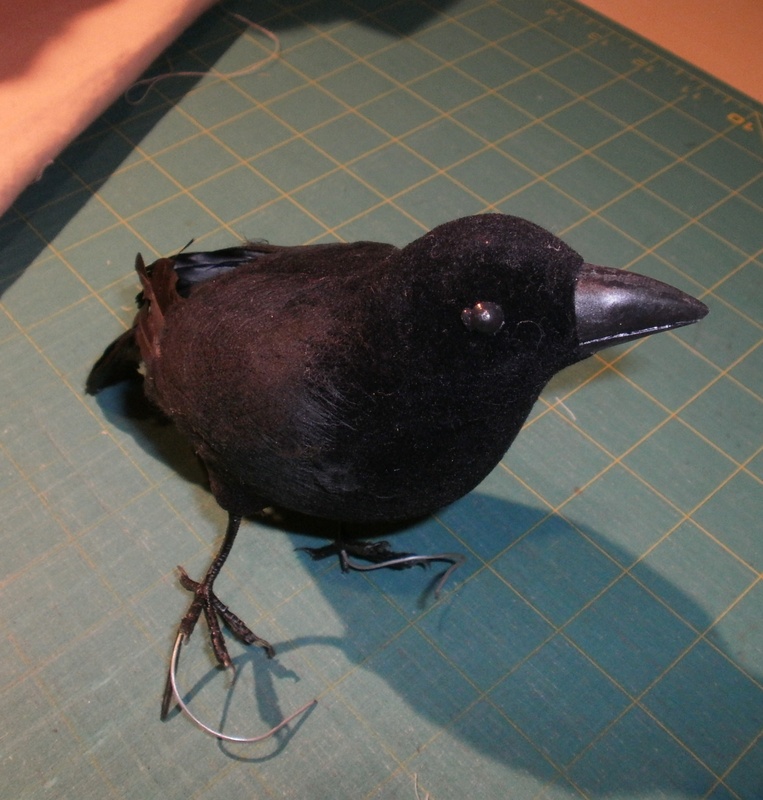 Crows are clever and observant – and I just happened to have this one left from the Halloween decorations. My little crow will remind me to plan. This is the one time of year I can indulge in my love of all things shiny. If that isn’t enough joy, I’ve got a recipe for killer gingerbread cookies. I bought these badges with small gift ideas in mind. I didn’t make any notes, so those ideas are gone. I can whine and moan, or I can pull out my graph paper and come up with a new idea. 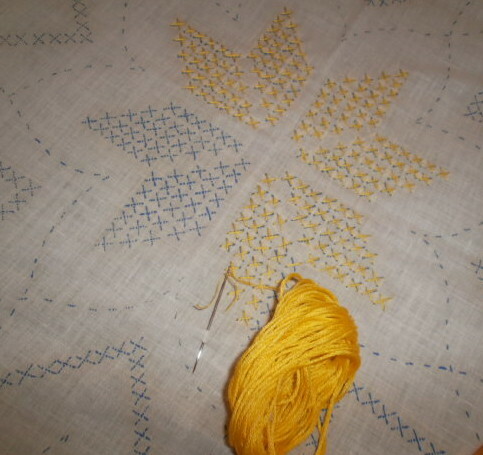 For now, I’m going to pull out the graph paper (the whining will come later when I design something I can’t sew). Before I forget once again, Julie Royce wrote about her crime novel in progress – PILZ – last week. You can read it here. Julie’s blog alternates between her novel and her travels. Check out her stories about her recent trip to Europe with her husband. My reindeer/moose herd grew this year. It wasn’t planned, but I found two adorable felt reindeer and couldn’t resist. 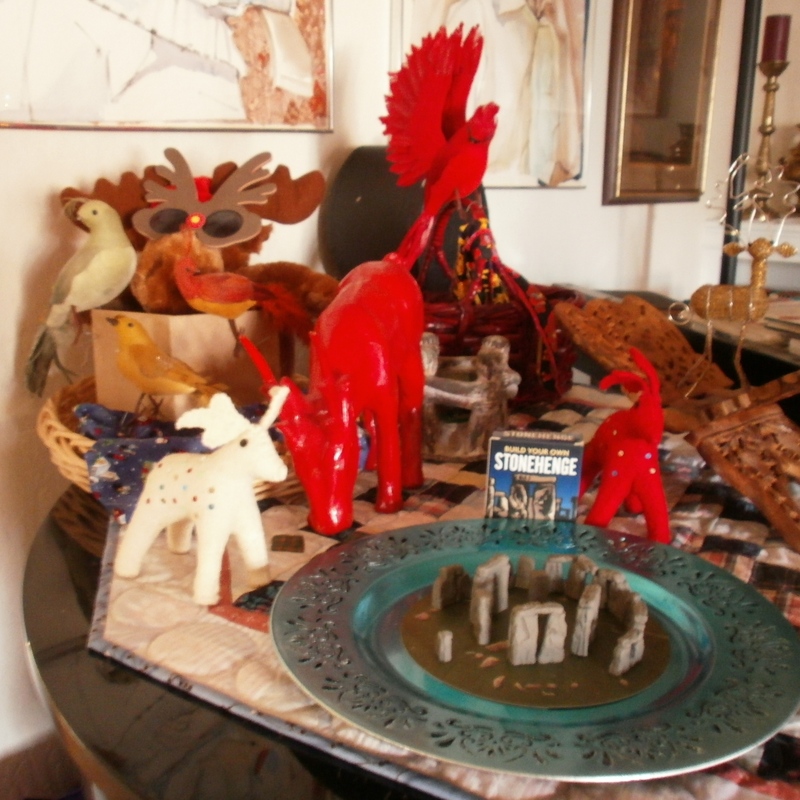 The dining table was too full of other stuff to hold the group, so I put the reindeer candlesticks on the table and the purely decorative critters on the piano, including my flock of Christmas birds. 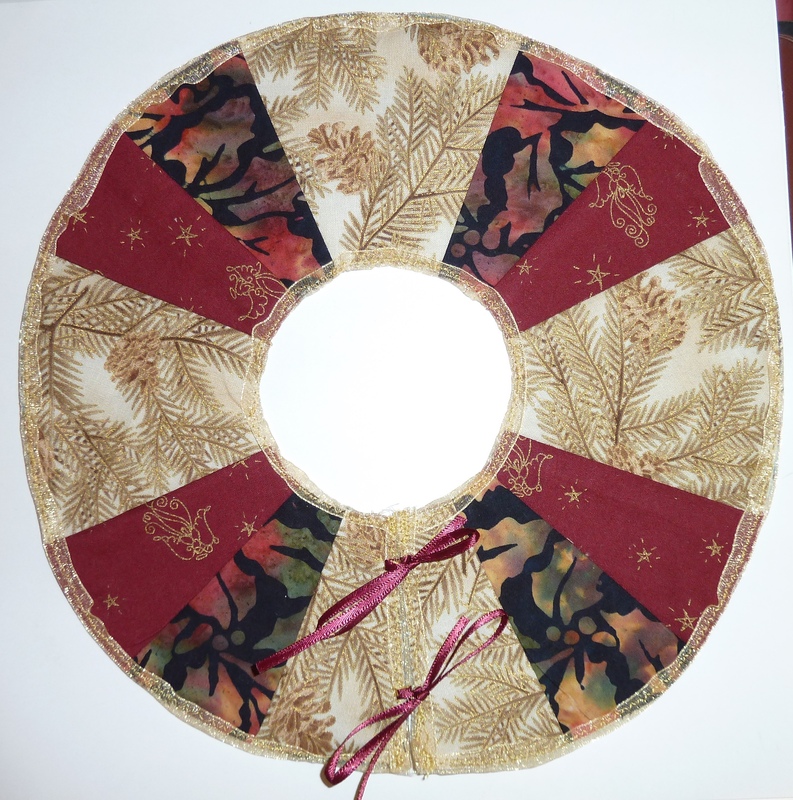 The sewing room is now in full holiday shambles mode – as is the rest of the house – but I’m not going to let that overshadow the season. There’s time enough to clean next year.